Buy 60 or more for $9.49 each. When you realize there's nowhere to go but into the arms of Jesus, you're in good company. Stacey Thacker, author of Fresh Out of Amazing, invites you to join her in exploring the refreshment awaiting every weary soul in the book of Hebrews. 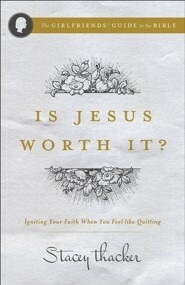 When life is hard, your heart might ask, "Is Jesus worth it?" Come hear the responding yes ringing through every verse of Hebrews. Stacey Thacker is a wife and the mother of four vibrant girls. Creator of the popular blog Mothers of Daughters, she is a writer and speaker who loves God's Word. Her passion is to connect with women and encourage them in their walks with God. You can find her blogging at staceythacker.com and hanging out on Twitter @staceythacker. The Girlfriends' Guide to the Bible series offers fresh, friendly, and faith-renewing wisdom on specific books of the Bible - perfect for individuals and women's groups alike. I'm the author/artist and I want to review Is Jesus Worth It? : Igniting Your Faith When You Feel Like Quitting.